NEW YORK -- Hall of Fame boxing referee Arthur Mercante, the third man in the ring for the first Joe Frazier-Muhammad Ali fight and more than a hundred other world title bouts, died April 10, 2010. Mercante, a longtime friend of ASA President Lou Schwartz, died at his home in Westbury, said Edward Brophy, executive director of the International Boxing Hall of Fame in Canastota. The cause of death wasn't disclosed. Flags at the Hall of Fame were flying at half-staff Saturday in Mercante's honor. "He was a complete professional inside the ring and true class act outside of the ring," Brophy said. "We will miss our friend and mourn his passing." The death of an icon in the sport quickly sent ripples through the close-knit boxing community. A salute was made by famed ring announcer Michael Buffer prior to HBO's telecast of Andre Berto's eighth-round knockout of Carlos Quintana in Sunrise, Fla., in defense of Berto's WBA welterweight title. "I knew Arthur real well and saw him just a couple months ago. Mercante was a terrific, terrific man, a real gentleman, and he loved being a referee and he really worked at it," said Top Rank Promotions CEO Bob Arum. "He was always in great shape and he was dead honest," said Arum. "You rarely realized he was in the ring because he was generally unobtrusive and he let the fighters fight." Mercante began his career while serving in the Navy, refereeing service bouts in the 1940s. He became a professional referee in 1954 and, six years later, was in the ring for his first world title bout when Floyd Patterson knocked out Ingemar Johansson at the Polo Grounds in New York City. Mercante would go on to referee 145 world title fights during his career, which lasted just short of five decades. He retired in 2001. The best referees are generally the ones who go unnoticed, quietly keeping order in the ring while the boxers do their thing. But not even Mercante could avoid the spotlight on March 8, 1971, when Madison Square Garden filled to the rafters for the "Fight of the Century." Muhammad Ali and Joe Frazier were both undefeated when they met in an event that transcended boxing, if not all of sports. Frank Sinatra was ringside taking photos for Life Magazine, Norman Mailer and Woody Allen were in the crowd, and fans filled movie theaters around the country to watch the closed-circuit telecast on the night of the fight. Mercante's full-time job at the time was working for Schaefer Brewing Company, and he received a call from the New York State Athletic Commission hours before the fight, instructing him and two other referees to show up at the Garden. One of them would be chosen to be in the ring, so that bookies and other unsavory characters would not be able to influence the referee. "Of course I was dying to get the assignment," Mercante wrote in his autobiography years later. "The minutes, then the hours, ticked away interminably." Mercante finally received word he had been chosen, and worked for the princely sum of $500. "He was the third man in the most important fight in the last 50 years, and he reveled in the fact that he was, but he had so many other experiences that it wasn't singular," said boxing historian and ASA member Bert Sugar, who considered Mercante a close friend and wrote the foreword to his book. Frazier won by unanimous decision, then lost to Ali in two more classic fights that Mercante did not work. Mercante, however, also received the call in 1973 to referee the title fight between Frazier and George Foreman in Kingston, Jamaica. 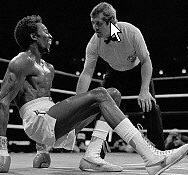 Remembered for the dramatic call by ASA Hall of Famer Howard Cosell -- "Down goes Frazier! Down goes Frazier!" -- it was Mercante who ended the carnage in the second round, after Foreman had dropped the champion an astonishing six times. Mercante also was in the ring in September 1976 when Ali fought Ken Norton in what eventually was the final bout at the old Yankee Stadium. Mercante kept control in the ring, even though the fight was a dreadful bore, while a police strike allowed for chaos outside of it. "A lot of the officials today are in trouble because they do not have experience," Mercante said in June 1995, when he was inducted into the Hall of Fame. "They are putting referees in championship matches before they pay their dues. They are putting judges in who have not had the experience. This is the reason there are so many bad decisions. No dishonesty, believe me. It's just incompetence." Perhaps that is why Mercante was so pleased that his son, Arthur Mercante Jr., followed in his footsteps in becoming a referee. Arthur Mercante Jr. has worked his share of high-profile bouts, including the controversial draw in 1999 between Evander Holyfield and Lennox Lewis at the Garden. "I think he took great pride that his son followed him into the business and has done so well. I mean, boxing is not a great tradition of father-sons. It's not like a clothing store or something of that ilk," said Sugar. "But Arthur took great pride in the fact that Arthur Mercante Jr. picked up where he left off," said Sugar. "He will never be as famous or well thought of as his father, through no fault of his own, because his father was one of the best."